The Electric Chair Salon was established in 1984 during the roar of rock ‘n’ roll when hair, art and music became the heart of identity. We are proud to say we're one of the longest standing salons in San Diego, home to dedicated stylists specializing in executing custom cuts and color with precision; merging the worlds of hair, art, and music into one experience only found here in our Salon and Gallery exhibit. Proudly serving San Diego with “best in class” service and style, for decades. When it comes to amazing stylists, our talent runs deep. Our artists specialize in a wide range of services. Whatever you imagine, we can achieve. We're here to help you realize your dream hair. 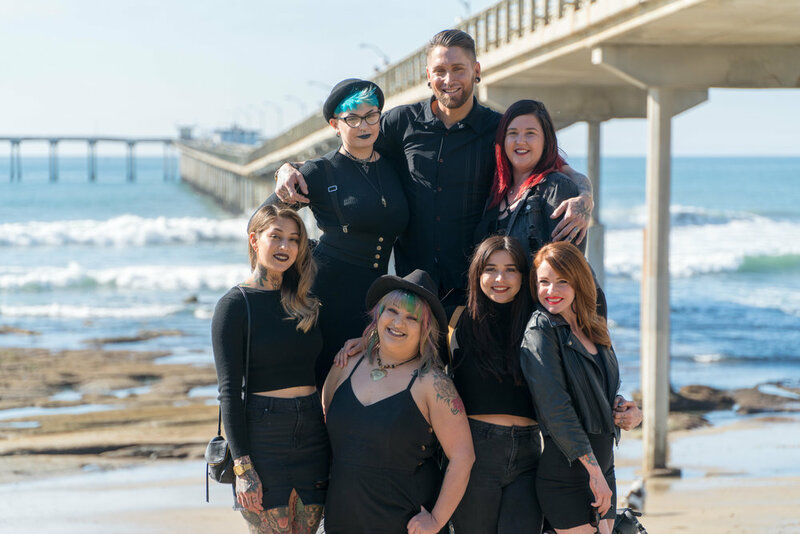 The Electric Chair offers custom vivid color, extensions, dreadlocks, braids, color correction, balayage, Brazilian blowouts, patterned undercuts, highlights, and haircuts. Our services have as much variety as our stylists and we welcome all ages and genders. For a more detailed listing of our services and prices, explore our Indulgences Page. 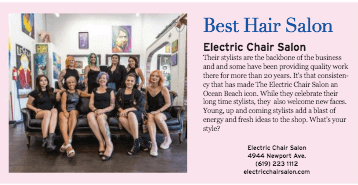 The Electric Chair has received wide recognition for standing out in Ocean Beach as the premier hair salon, both in terms of our design and precise service. Collectively our team has received city wide recognition with numerous awards from the local community as well as City Beat Magazine’s “Best Of” award for over a decade. We've also won “Salon of the Year” in the Beach & Bay Press 3 times, the "Best Hair Salon 2017" in The Peninsula Beacon, and are a proud member of The Professional Beauty Association, supporting the “cut it out” program to help raise awareness on domestic and emotional abuse. Knowledge is power. If you want to experience what has gotten people talking for over 33 years, visit The Electric Chair Hair Salon and Gallery. We believe in ethics, community, and being of service. Whenever you walk through The Electric Chair’s doors, you are more than just a client. We believe with every haircut a new relationship is established that will hopefully last for years as you become part of The Electric Chair family. Visit us, love your hair! Call 619-223-1112.